McKiernan: "This is not a temporary force uplift"
WASHINGTON (CNN) -- Gen. David McKiernan, commander of U.S. and NATO forces in Afghanistan, predicted Wednesday that the additional 17,000 U.S. military forces to be sent to Afghanistan will remain there for as long as five years. The commmander predicted the new troops will be operational before Afghan elections in August. "This is not a temporary force uplift," McKiernan said. "It will need to be sustained for some period of time, for the next three to four to five years." McKiernan made his comments a day after President Obama approved the troop increase for Afghanistan. "I'll use most of those forces in southern Afghanistan, an area where we do not have sufficient security presence, an area that has deteriorated somewhat," he said. He predicted that the extra troops will be operational before the planned August elections. He cited three decades of low literacy rates and rampant poverty and violence. The outcome will not be decided militarily but politically: "by the people who live in Afghanistan," he predicted. 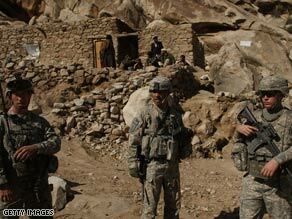 McKiernan said the U.S. goal is to double, "in a holistic way," the size of the Afghan army to about 134,000 members. That transformation, he said, "will require not only more trainers and more of a partnering and mentoring effort, but additional funding." Of his current troop request, he said he has received "roughly two-thirds of what I asked for." Asked whether that number will suffice for his needs, he hedged. "Having what I need is always a hard question to answer," he said. "I have what I've asked for. "I want to get to what I call the tipping point, where the lead for security is in Afghan units, police and army, and we increasingly are more in a training and mentoring role," he said. "I think you can have too many foreign forces in Afghanistan."